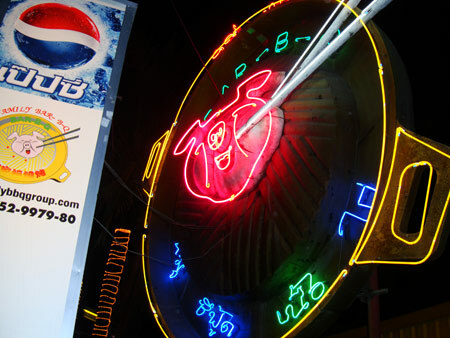 Moo Kata is probably one of the most popular get together meal among the Thai. Moo Kata means pork skillet and some Thai friend’s told me is pork pan. The price is cheap and the value for the meal is just incredible. For those of you who are not familiar with moo kata, it is something similar to hot pot and BBQ at the same time. I don’t think I can put the cooking device of moo kata in words, so I’m just going to post a picture so that you can see it for yourself. Okay, this is how the moo kata cooking device looks like. On the center, is like a dome with some space that shaped like long lines. Below the dome is where hot charcoal are burnt to cook the meat. Surrounding the dome is a space where water or broth are stored. It’s not really deep but kind of shallow. A kettle of soup is provided for you to keep adding water. When the waiter brings you the moo kata pan, a piece of pork lard is provided and it’s normally placed at the center of the dome. The pork lard will then melt and produced oil and drips from the top of the dome down to the broth area. This actually allows the dome to oil up so that when you place meat onto the dome, meat will not stick to it and burn. The oil from the pork lard and drips into the soup and this makes the broth even tastier. The soup area is good for cooking fish balls, meat balls and vegetables. Initially I found the cooking method of moo kata a little bit odd as the dome area is kinda small for you to put your choice of meat. 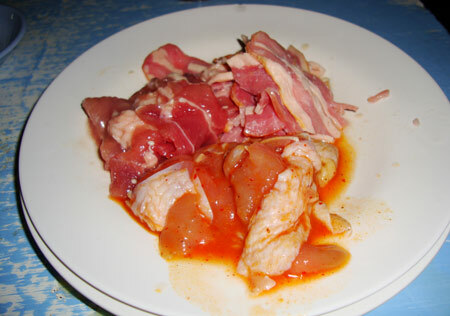 My meat kept falling into the soup and I have to use my chopstick to put back my fallen meat onto the dome. This will make my meat not so crispy like normal BBQ grill. The shallow area for the broth was also odd to me compared to normal hot pot pan. 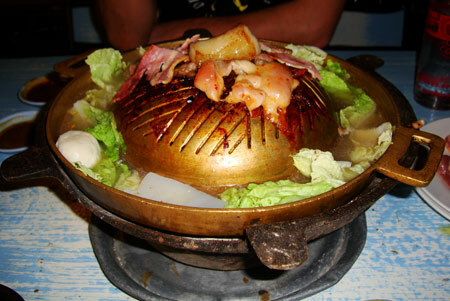 But after looking at the other table, the Thai people were very skillful in placing the meat on top of the dome. They can stack the meat on a few layers and the meat will not fall. Looking at our next table, I get the feeling that the meat weren’t supposed to be really crisp like BBQ. I am guessing that the method of cooking the meat is more like making smoke meat. Having good skills with chopstick is definitely an essential aspect of eating moo kata in a large group. Everybody was doing their part in stacking and flipping the meats. Meat balls, fish ball, vegetables and some sort of sea plants. All this are to be cook in the broth area. The moo kata restaurant that we went to was situated near Huang Kwang mrt station. 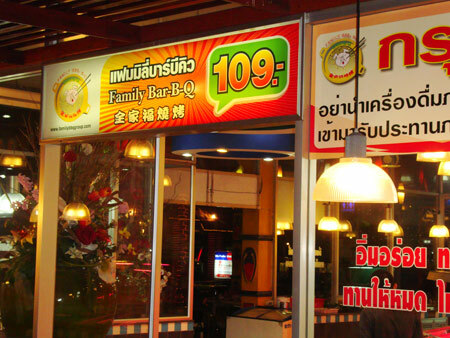 It is known to many as Family Bar-B-Q moo kata in Ratchada. The price for per person is 109 Bht excluding drinks. It is served buffet style and you can eat as much as you want. 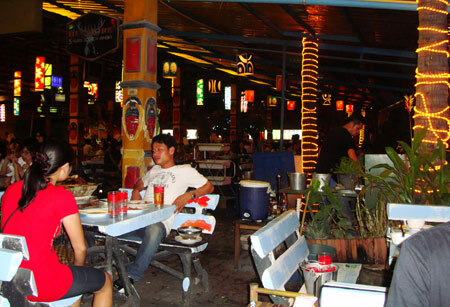 Besides all the raw food that you need to cook yourself, the restaurant also serves fried noodles, fried rice, fried sausage, green curry vegetable with plain rice, sushi like rice rolls. 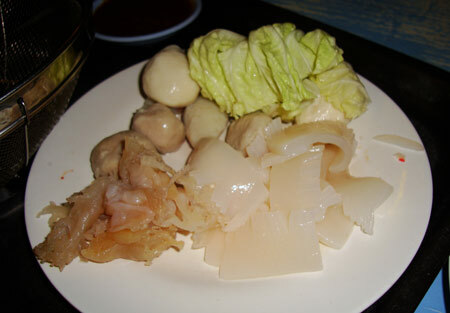 As for the raw food selection you have chicken, beef, pork, innards ( pork liver ), sausage, fish balls , meat balls, shells and some funky sea plants. Around the sauce area ( they have a wide selection of sauces for meat and seafood ), they have a Thai device for you to make the famous papaya salad ( som tam ). All the ingredients are there for you to add and mix yourself. 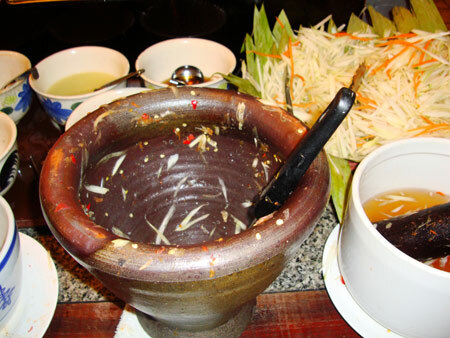 This could be quite a task for foreigners who has no idea what are the best mixture to make a tasty som tam. This place is huge and I think it can easily sits 500 of patrons, maybe even more. 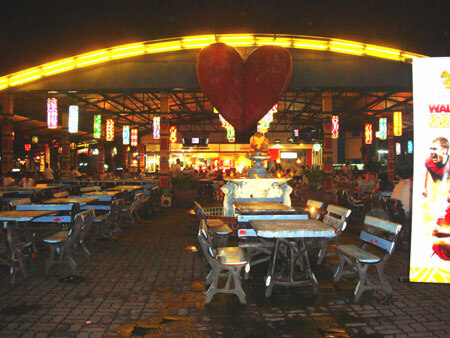 We went around 10.30 pm that day and most people has already finished eating. If you were to go at 7pm, you will probably be given a number and wait to be seated. Is really packed during dinner time. Customer looking really satisfied and full or is he just taking a break before continue eating. Is buffet style anyways. Our bill came to around 400 Baht for the 2 of us. We order few bottles of water and few bucket of ice. In Thailand they normally charge for ice cubes. I still think with the big selection of food, the price is extreme reasonable. 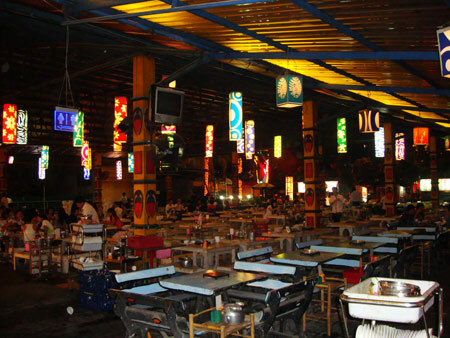 The whole process of dining moo kata with a group of large friends normally takes around 2 – 2.30 hours. While cooking the food, friends can catch up with each other. We heard loud laughter all around the tables as friends were joking with each other. 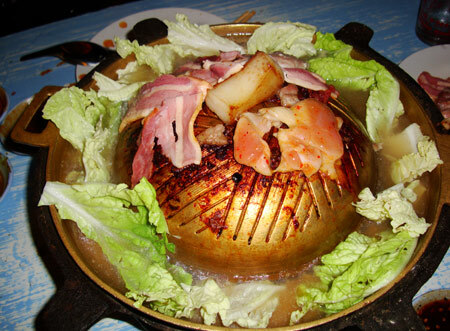 Eating moo kata will definitely put you in a very cheerful mood as you know you will never burn a hole in your pocket. I highly recommend moo kata to everyone who will be visiting Thailand. I want so much to buy a Moo kata. Please can you help. The moo kata restaurant of this post is no longer operational. Not sure where they go. 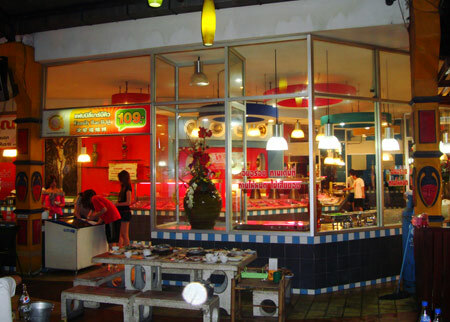 But there’s so many other moo kata restaurant around Bangkok.